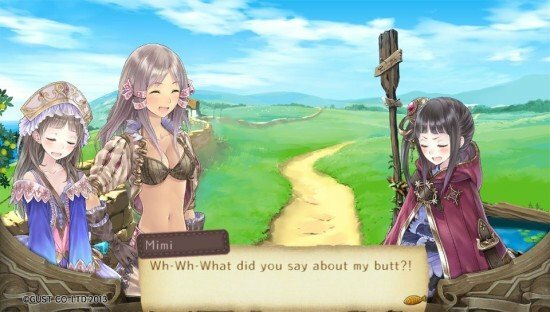 Atelier Totori is an acquired taste. Actually, the Atelier series as a whole are JRPGs that, while not exactly ‘divisive’ – represent a handful of games around which there’s either a dedicated following or, well, a general apathy towards. I used to be in the latter camp. 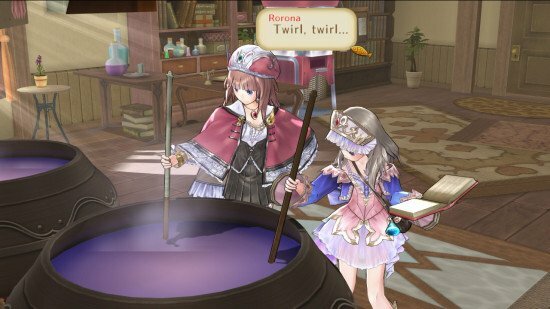 For this Atelier Totori Review Switch I hope to fine some new converts! There’s no escaping the fact that JRPG’s as a genre share all manner of mechanics and tropes – many of which you’ll certainly find in here – but perhaps universally among these is the theme of a band of adventurers embarking on an epic adventure. The atelier series in unique in that, well, there’s nothing ‘epic’ here to speak of. At all times, Atelier Tortori feels humble, domestic, homely – parochial almost. It’s concerned less about the big, grand narrative, the impending world-destroying terror, the prevention of the apocalypse – and more with friendship, family and being nice. It’s hard to dislike that kind of gentle sentimentality. 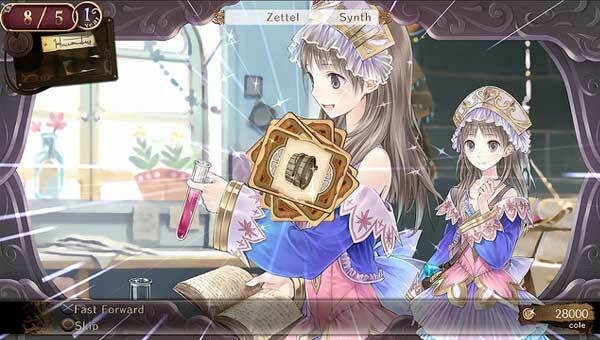 Atelier Totori’s story is relatively simple. You take control of Totori, a sweet girl, lacking in confidence, trapped in a small village and with a burning desire to be an Alchemist. Someone who turns things into other things with a big cauldron. She’s not very good at it. Actually, she’s pretty terrible at it – and has no way to really improve thanks to the fact that there are cute monsters outside the village who might hurt her, so she can’t go gathering the ingredients she’ll need to improve. She lives with her father and over-protective sister. Her mother in absent – a once great ‘Adventurer’ who went missing some time ago – and it’s around this fact that Atelier kicks off. With the help of a friend, Atelier, against her family’s wishes, decides to set off to become an Adventurer like her mother, in the hope of someday discovering what happened to her. So off she goes, armed with nothing but a good friend, his sword and a sunny disposition. 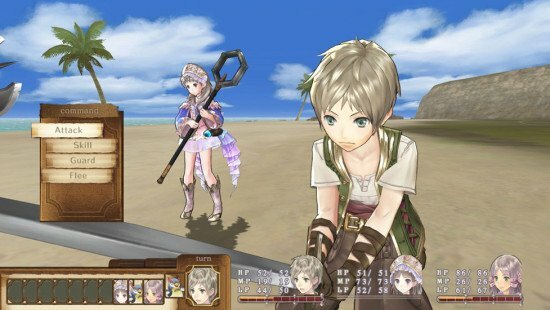 On the face of it, Atelier is is much like any other JRPG. You begin in a sleepy village, explore a map (menu style rather than overworld) and engage in turn based battles. As you visit new towns and areas, you meet an eclectic cast, recruit, and then swap in and out new members to your band of travellers and seek out new skills, weapons and armor as you level up, in order to defeat stronger enemies and advance the story. 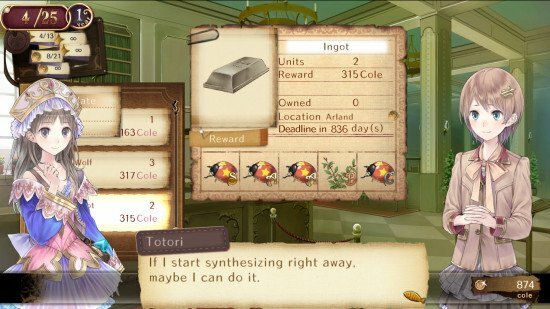 Nothing out of the ordinary there of course – but outside this familiar core is a metagame so deep that the experience of playing Atelier Totiri is significantly different. Alchemy is at the heart of everything in this game. The map is broken up into paths and locations. The vast majority of these locations are tiny areas for you to explore. In each area you’ll find points of interest, gathering spots in which to collect ingredients, different enemy types to defeat – which in turn yield specific kinds of ingredients. Often, you’ll bump into different characters for impromptu dialogue skits. The ones you see, or don’t – are triggered by all kinds of different criteria, and so one person’s first play through may differ somewhat to another players. Once back at home or in a town, Atelier can then turn these ingredients into other items or, crucially, other ingredients to make more advanced items. Combine a few herbs to make a healing salve. Combine a few herbs and liquids and enemy drops to create cloth, that can be combined with other indredients to make more protective clothing. Find rocks to turn into metals, to combine with other ingredients to make better weapons. The more stuff you make, the higher your alchemy level. The higher your alchemy level the better stuff you can make. While there is a sense that you’re simply unlocking a bigger, more convoluted crafting tree to reach ‘the best stuff’ – Atelier is actually much smarter than that. Every ingredient you pick up has different stats. Two of the same item will range in quality for example – but they’ll also carry a huge range of stat modifiers – imbuing crafted items with elemental properties. The ability to poison, or have a better armour rating, or improved speed. The possibilities are mind-boggling – you can have two identical weapons for example – but each different enough from each other thanks to your shrewd combining of items with different qualities. What appears to be sweet and whimsical on the surface is actually a pretty hard-nosed game of crafting and item management which, frankly, can feel pretty overwhelming at times. And stressful. Perhaps the one aspect of Totori that I dislike the most is that there are time constraints. Everything you do from travelleing, to gathering, to crafting and battling consumes time. A journey across the map to collect certain ingredients and them bring them home for crafting consumes days and months. This is significant for a number of reasons. As an ‘Adventurer’ – a profession which, in the game world, requires a licence – you’re required to achieve certain milestones, ranks and challenges. To Rank-Up your licence you have to fulfill sub-quests and jobs – and a certain rank must be met by a certain date for that license to be renewed. Go here and find every gathering spot,defeat x amount of monsters, craft y amount of a certain item, defeat z boss monster. Jobs in particular, have to be completed within a set amount of days – and so every time you leave town you have to consider – what jobs can I fulfill in this time, what ingredients do I need to pick, what monsters do I need to look out for – and can I craft everything in time when I get back. It requires a level of planning that borders on… intense. I’ve had real-life jobs that are less stressful, and require less work than this. Endure it though, and Totori can be uniquely rewarding. Crafting something really awesome can prove quite the thrill – but I guess just how thrilling depends entirely on your personality. What kind of person or gamer you are. It’s certainly not for everyone and will require a great deal of patience. Personally, I enjoyed it. If I had to give one piece of advice, that would be to say, on your first play-through – try not to be too OCD in your approach. Succumb to the realisation that it’s best to enjoy the ride blindly first- see where your journey takes you. Don’t get caught up in trying to craft the best items, or 100% your trophies – simply enjoy the world and the cast of characters to which ever conclusion you get (for there are many) and then, should the mood take you, aim higher on your second attempt when you have hindsight as your guide. Once I’d taken this approach, I really began to love Totori – both character and game. Visually it’s a delight – and I’ve made no secret of my love for Mel Kishida’s character designs, not to mention the cosplays they inspire. The PS Vita‘s gorgeous screen really brings our the character portraits – and provides a richness in colour to the pastel shades that I’ve often found lacking on PS3 at times. Likewise, once I’d settled into the more gentle nature of the narrative, I found myself really looking forward to returning home to see what dialogue would crop up. 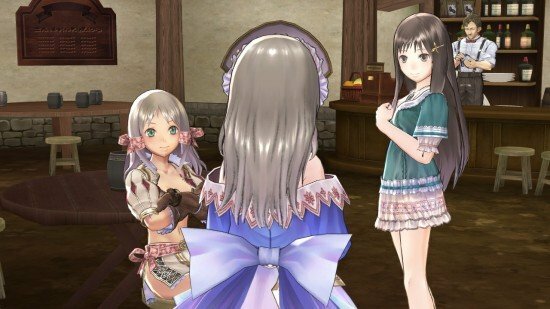 In a world where nothing hugely dramatic happens, the little things – the touches of humour or a small development in a relationship – become that much more important, and feel more significant – and I found Atelier Totori to be all the more emotionally involving as a result.